New Ultra Low Water Urinals utilize only 1 pint (0.125 gallons) of water to flush. These systems combine the vitreous china fixture with either a manual or sensor-operated flush valve. Ultra Low Water Urinals provide effective, low-maintenance flushing in public restrooms while reducing water consumption by as much as 88 percent. Zero water urinals use no water at all, saving an average of 45,000 gallons of water per year. These products use a special trap with lightweight biodegradable oil that lets urine and water pass through but prevents odor from escaping into the restroom. Click here for a list of rebate-eligible urinals. 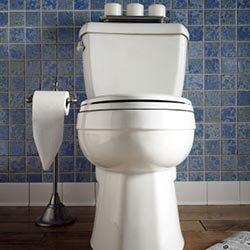 Contact your local plumbing contractor or visit a plumbing supply house to purchase rebate-eligible urinals.